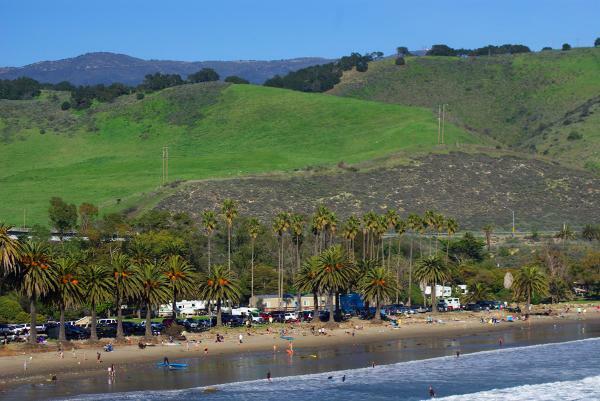 Refugio State Beach is one of the true gems of the Gaviota Coast and a longtime local favorite. 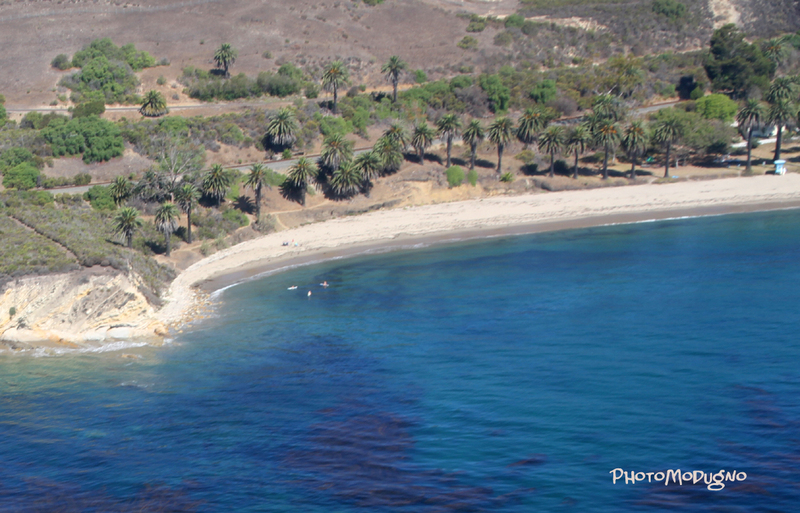 Campers, fisherman, hikers and surfers all enjoy the peaceful solitude and refuge found there. The statuesque palm trees that line the cove give a distinctive and majestic look to the area. 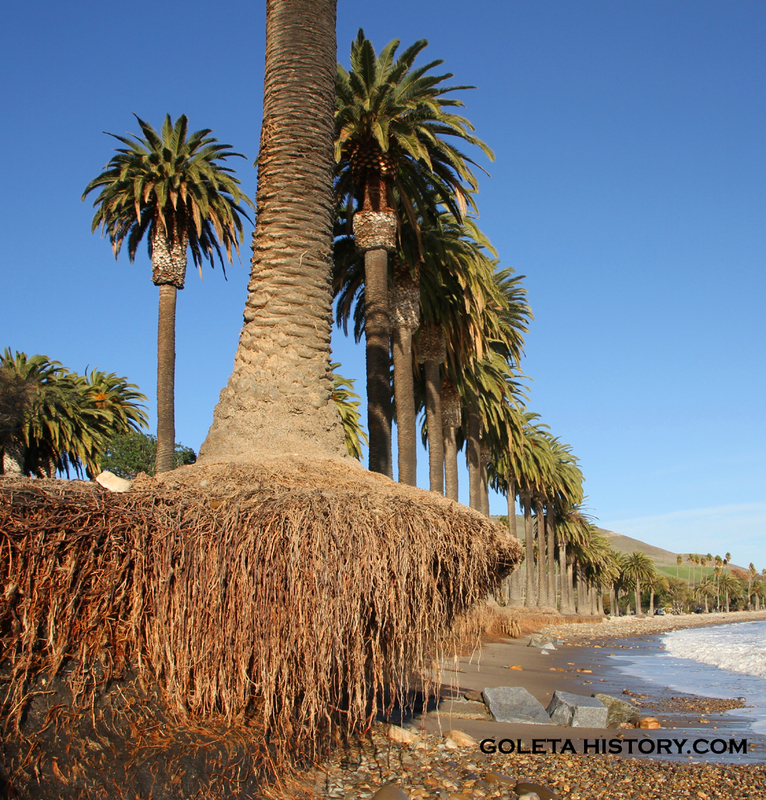 Over the past few winters, those iconic palm trees have gotten closer and closer to the tide line, thanks to a severe lack of sand on the beach. The much talked about El Nino of 2016 has brought lots of pounding surf to our coastline but not much rain, further removing what little sand we had left. Add to that some extremely high tides, and the result has been some severe damage to our coastline. 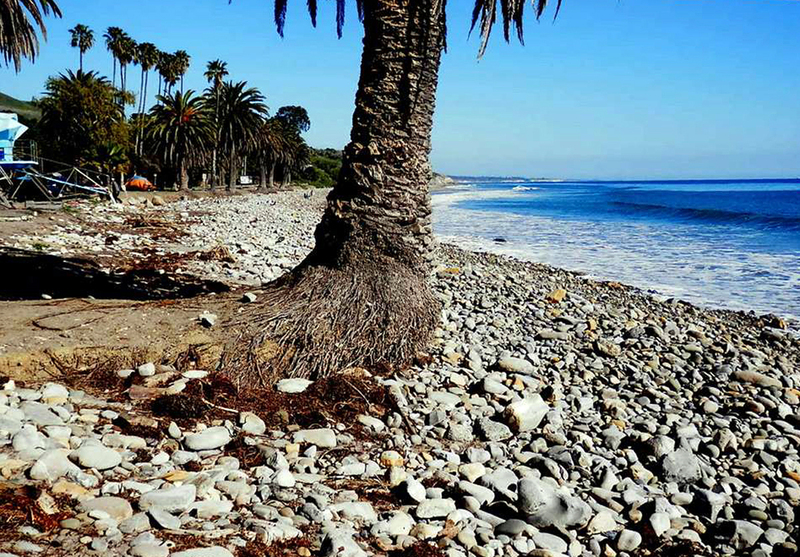 This has been a recipe for disaster for the Refugio palms. 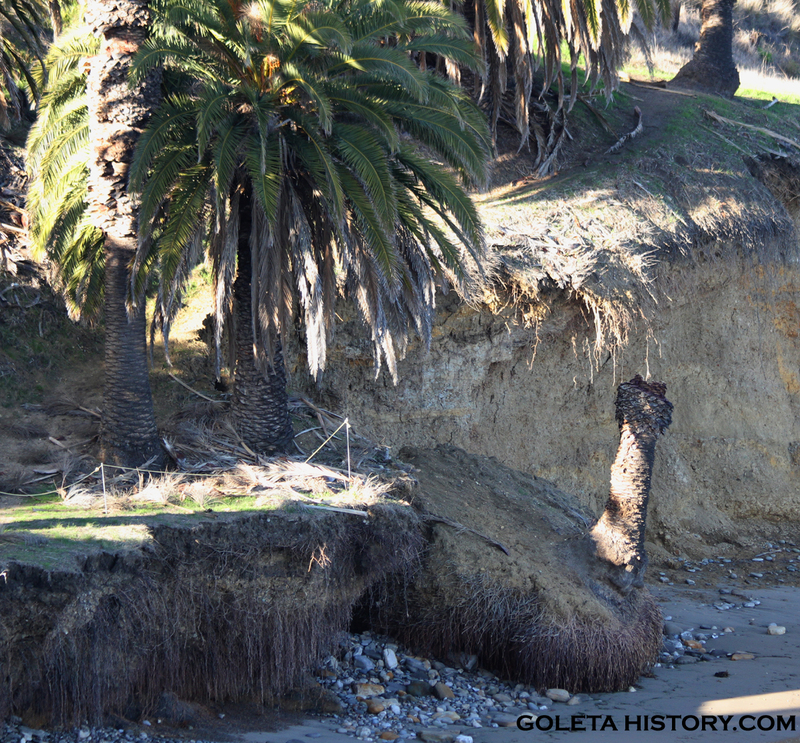 This winter, several of the old palms have been washed out to sea, and many more are about to follow suit. While most everyone agrees the palms are beautiful and and a landmark of the area, most folks have no idea how, when or why those palms got there. 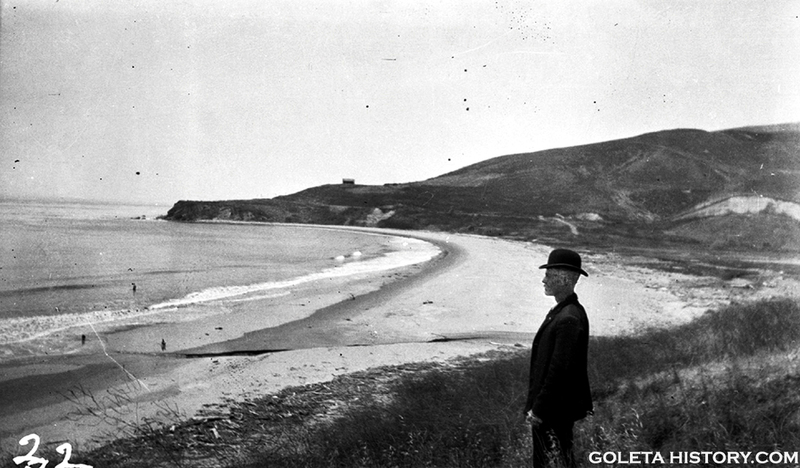 So here’s their story- In the early 1900’s, Goleta pioneer Stephen Rutherford bought the Refugio property. It was a brushy, tree covered swamp until about 1920. 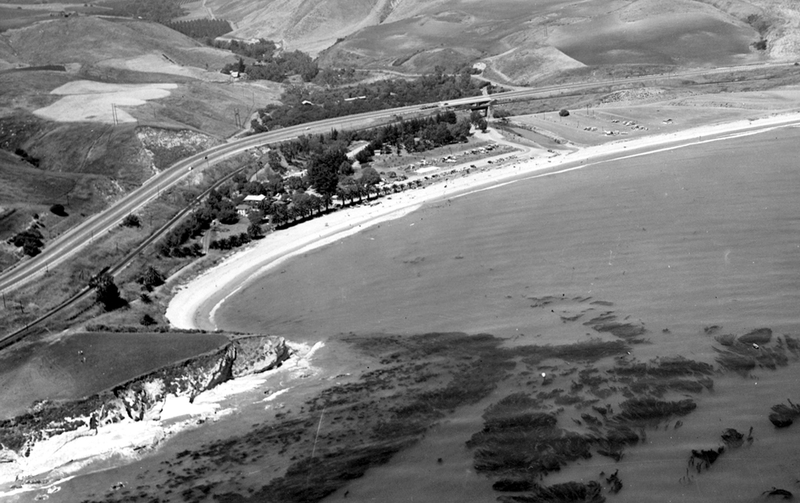 Ranchers from the Santa Ynez Valley would drive their cattle over the Refugio Pass and stop at the beach for a rest before sending their beef off to be sold. Other than that, there were just occasional fisherman and picnickers visiting the area. Tired of paying the property tax on land he never used, Stephen Rutherford offered the property to Santa Barbara county for free, but they refused. Their response was, “there is lots of beach, but not many people”. In the early 1920’s, automobiles were more prevalent and that brought more people up into the area. Refugio started to become a destination spot, and that’s when the state health officials got involved. They told the Rutherford family that if they were going to allow people to congregate on the beach, they needed to install restrooms. The Rutherfords said they didn’t invite the people, they just went there because it was free. They tried to dissuade the visitors by putting up a fence and a “No Trespassing” sign, but those were quickly torn down by the public. The Rutherford’s neighbors convinced them they should build some facilities and charge admittance. Once they did, they realized they had something good going. Stephen Rutherford’s grandson, Nelson Rutherford took an interest in the new family business and he expanded the operations. He brought in some rental boats, built a store, cabins and a small house, that are still being used today. 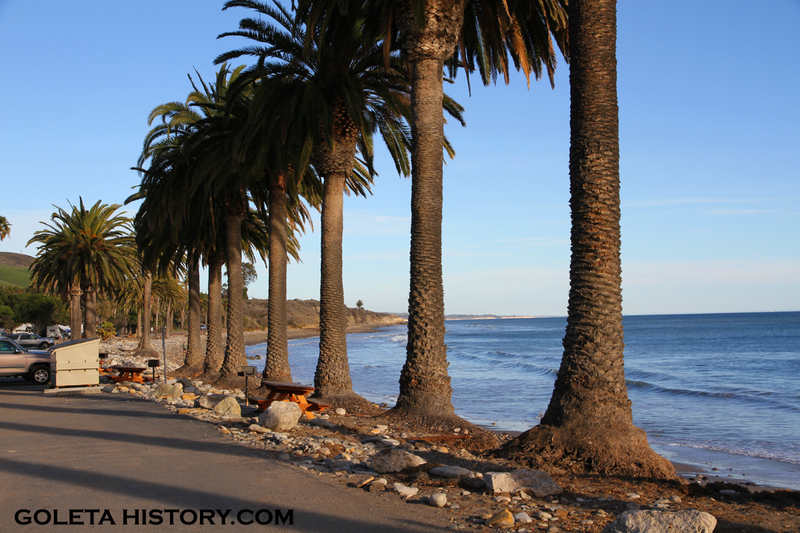 It was around this time, estimated to be 1928, that Nelson Rutherford planted the palms at Refugio. 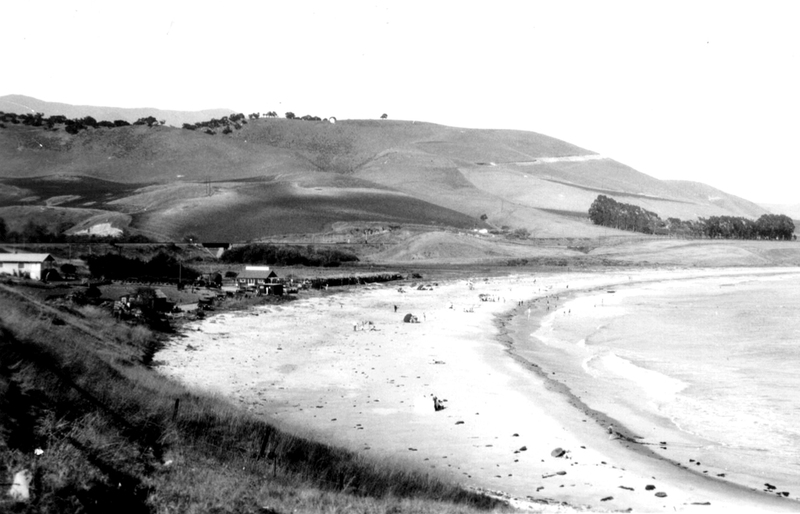 With the oil boom at Ellwood, geologists were drilling all up and down the coast. At Refugio, instead of oil, they found hot sulphur water. 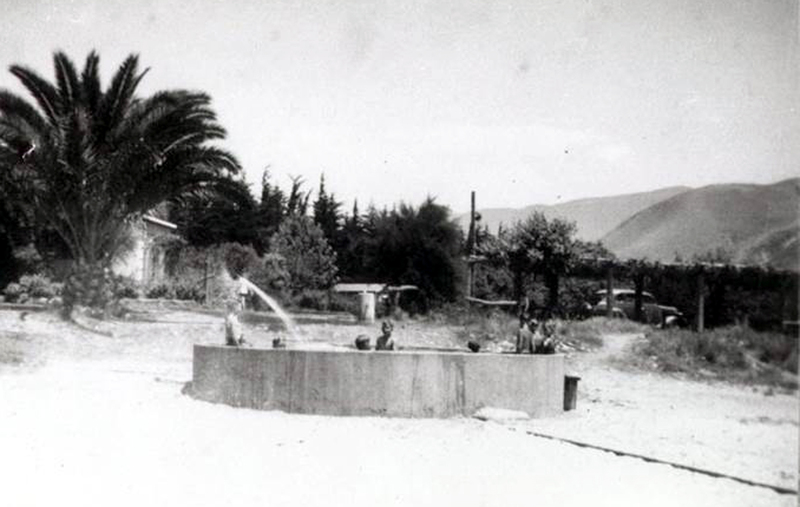 The Rutherfords built a concrete pool by the beach and the mineral bath was a big attraction. Every year the winter tides destroyed the pool, and for three straight years they rebuilt it. 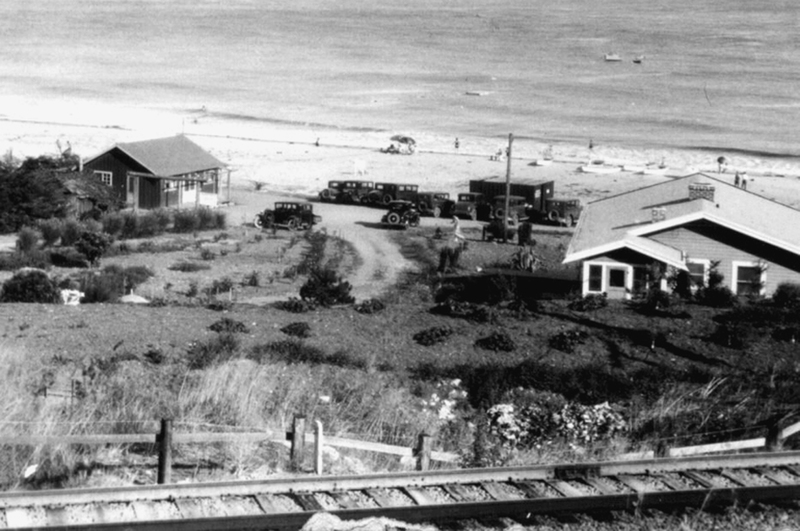 Throughout the 1930’s, more landscaping was done and more structures were built, and more people came to the beach. 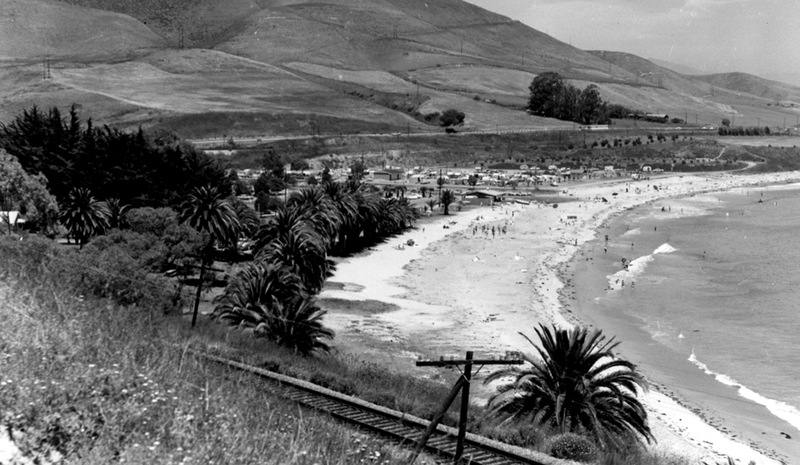 Nelson kept the beach open from Memorial Day to Labor Day, and he charged 50 cents per car for day use and $1 per car to camp overnight. For another buck, you could get a barbecue dinner that included meat, beans and homemade ice cream. During the depression, a hobo would occasionally walk or ride into the park on a donkey and offer to trade a few hours of work for a hot lunch. 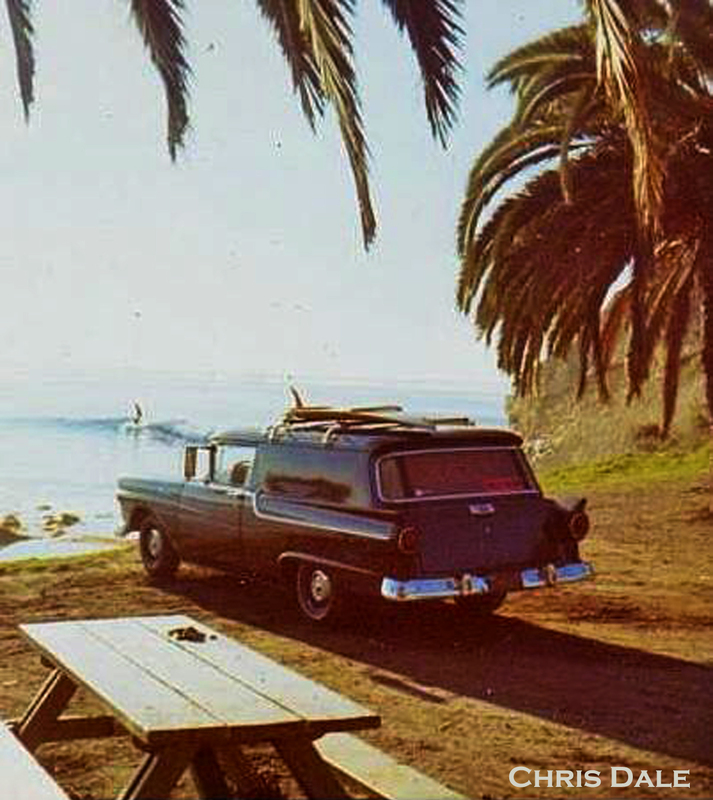 Nelson Rutherford ran the camp for years and dealt with things like wind, sunburns, health officials, and tar on the beach that guests would step in. Some campers had never seen the ocean before and wanted to set their tents up on the wet sand of a low tide. During prohibition, the Rutherfords heard about illegal rum-running on the beach, but they never caught anybody in the act. They would hear the dog barking like crazy, but by the time they got down there all they would see was tire tracks in the sand. 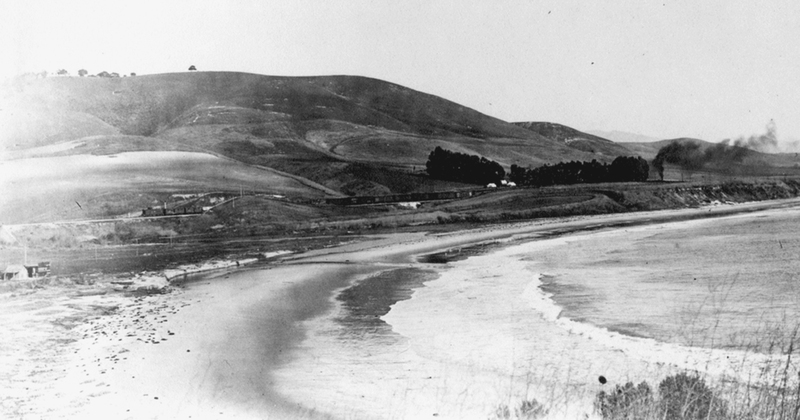 Not much different than today’s pangas… In 1942, a Japanese submarine shelled the Ellwood oil fields, and the coast of California was suddenly the western front of World War II. 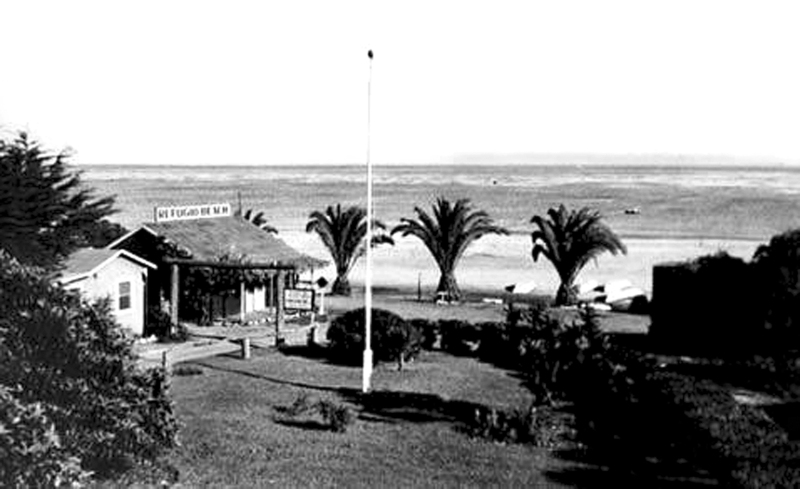 Shortly thereafter, the Army set up a radar unit at Refugio, and that shut down the thriving beach resort until 1946. 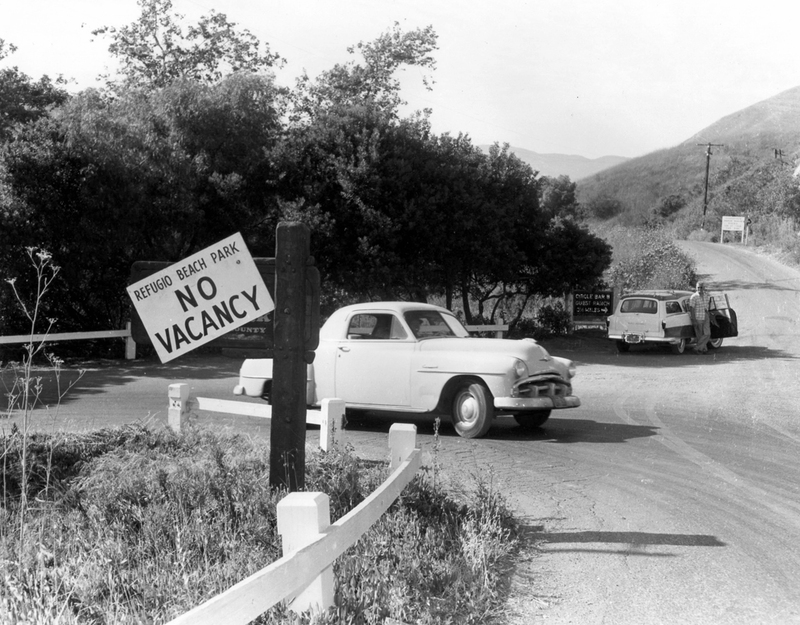 When the military unit pulled out, much of the resort had been damaged, and the Rutherfords weren’t sure if they wanted to continue running the campground. In the end, they decided to sell the property to the state for $105,000. 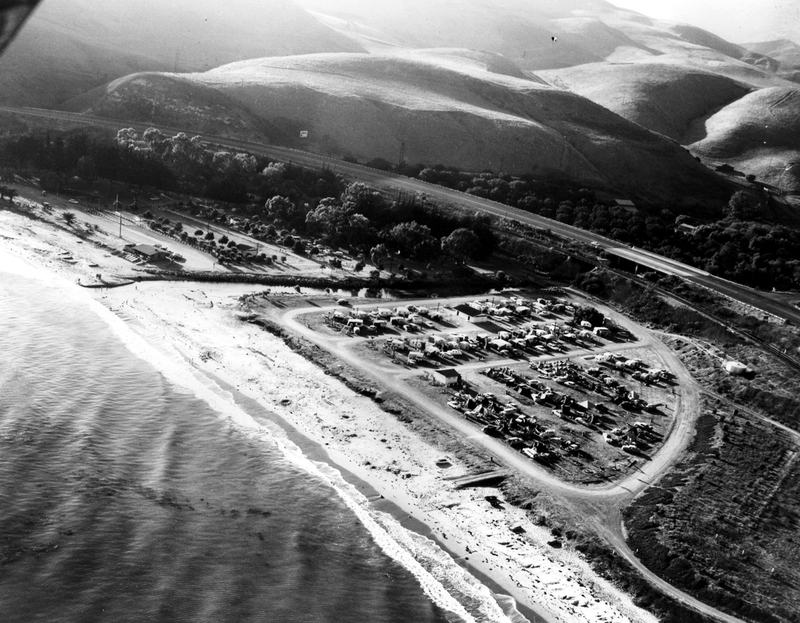 Refugio Beach Park continued to flourish as a popular get away spot, close to town, but far away from the world. 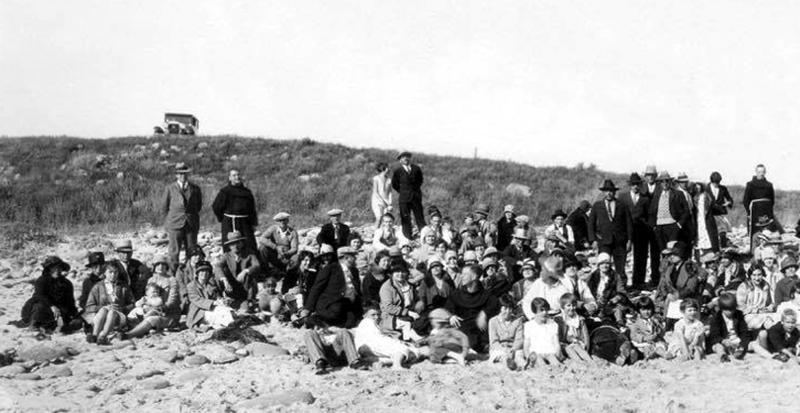 And when surfing became more popular, so did Refugio. How’s that for a parking space, eh? The campground continued to grow to accommodate the growing crowds. And through the years, as the crowds grew, so did Nelson’s palms. Today, the campground is world famous, and campsites need to be reserved months in advance. 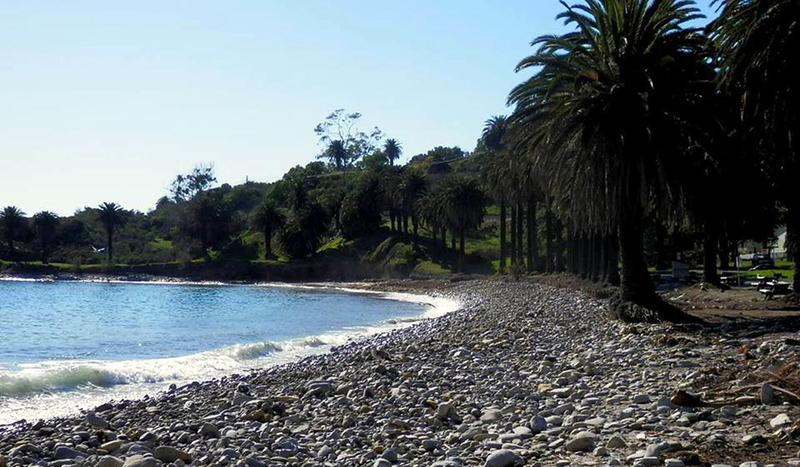 Nelson Rutherford’s palms make the cove at Refugio even more beautiful, and they give it a characteristic unique to the Gaviota Coast. 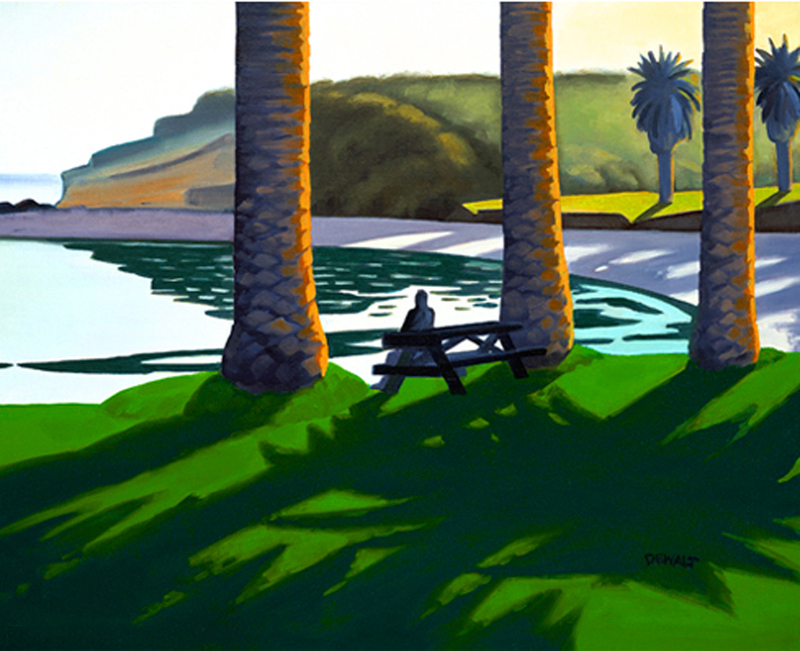 Many successful artists have been inspired by the palms in the cove, such as Tom DeWalt. Chris Potter. And Jeffrey Campbell. So here we are today, nearly 90 years after these palms were planted, and they are now hanging in the balance. It’s no longer a question of “if” they will be washed away, it’s now a question of “when”. 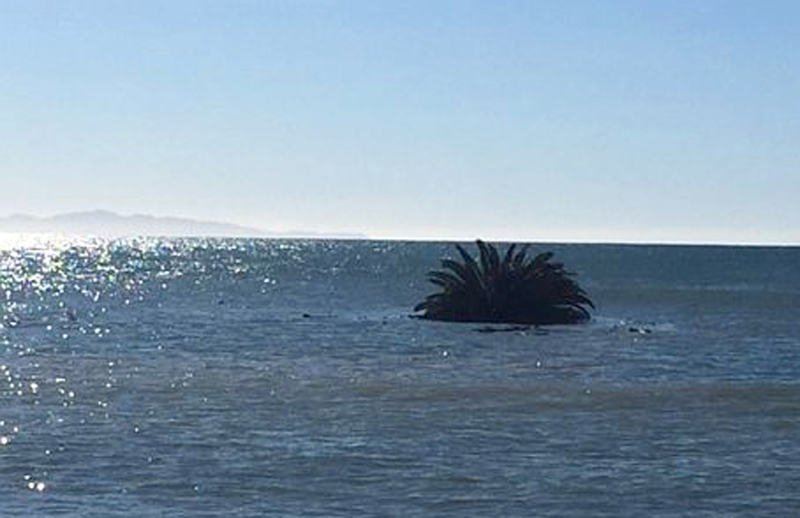 As of January 2016, several of the palms have already been taken by the tide. As onlookers watched, they drifted out to sea. 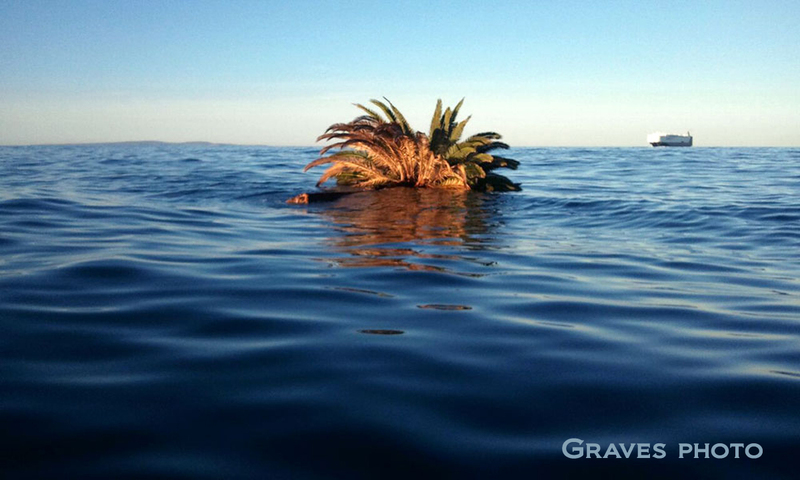 A noble burial at sea for a landmark, nearly a century old. These palms are not hard to transplant, and Mother Nature has done most the work already, exposing the majority of the root ball. But in these days of budget cuts and deep deficits, the chance of these palms getting saved is slim to none. So you might want to go up and take a look at the Refugio Palms and try to imagine all the changes they’ve been a witness to. If these palms could talk…. When young Nelson Rutherford planted these in the late 1920’s he probably never dreamed they would still be standing in 2016. 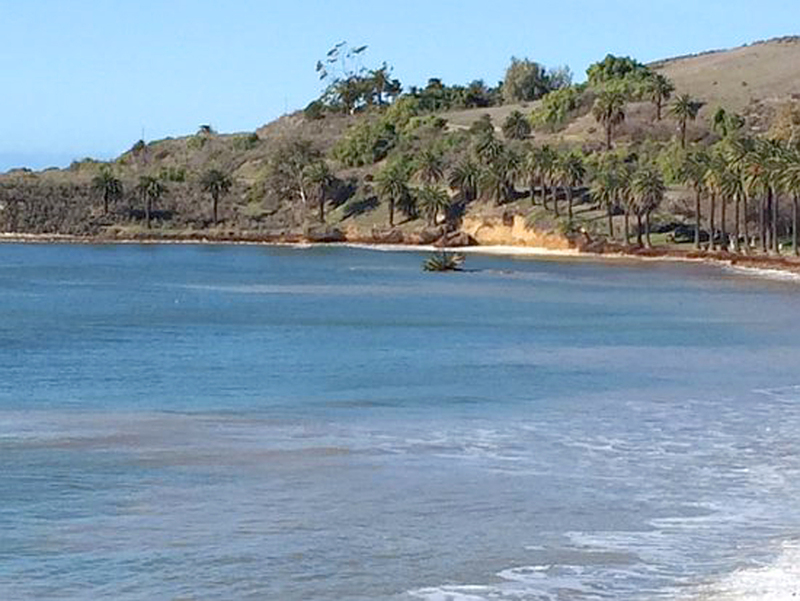 Here’s a link to the Refugio State Beach official page. Also links to artists Tom DeWalt, Chris Potter, Jeffrey Campbell. Sources: Santa Barbara News Press, John Wilkens, Wikipedia, Walker Tompkins, UCSB, www.orellaranch.com, Tommy Keeler, Mark Sanchez, Santa Barbara Independent, Chris Dale, Edhat, Richard Michael Fisher, Tom DeWalt, Chris Potter, Santa Barbara Historical Museum, and very special thanks to Michael Redmon. another wonderful article! the research and accompanying photographs and paintings were just right. this story is a delight… thank you. and can we save the palms? Such a good educational and illuminating article, well written and illustrated , thank you! Save those palms!! would it be possible to set up a “go fund me” accound so we could save these beautiful palms? I see people who have an account for just about anything thats important! Sad to see them gone, it almost looks like the Hawaii coast. I agree, they need to be saved. What makes this even harder is we’re dealing with the State…. 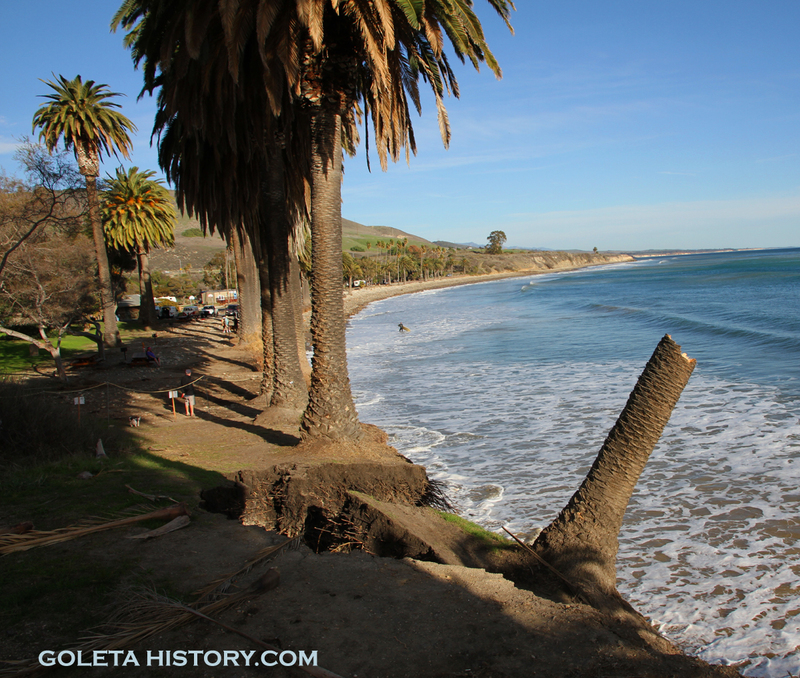 The article on Refugio Beach was so interesting to read and see the photos. 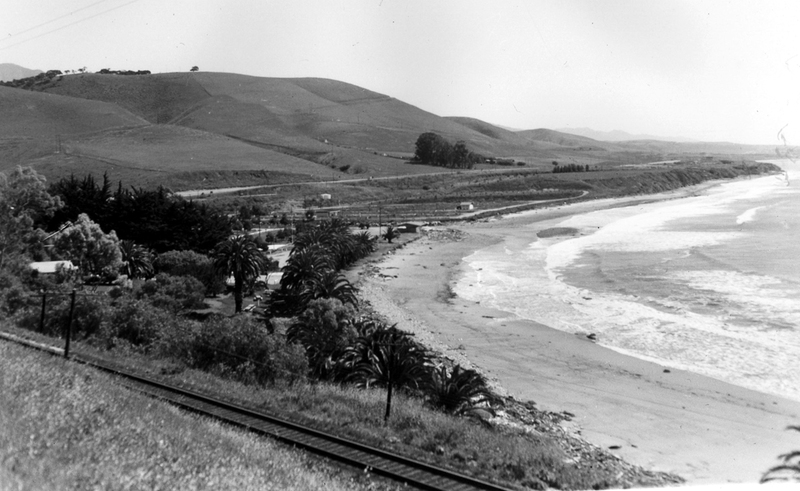 It was my favorite beach when I was in high school in Lompoc (Class of 1961). It is sad to see the palm trees wash away. 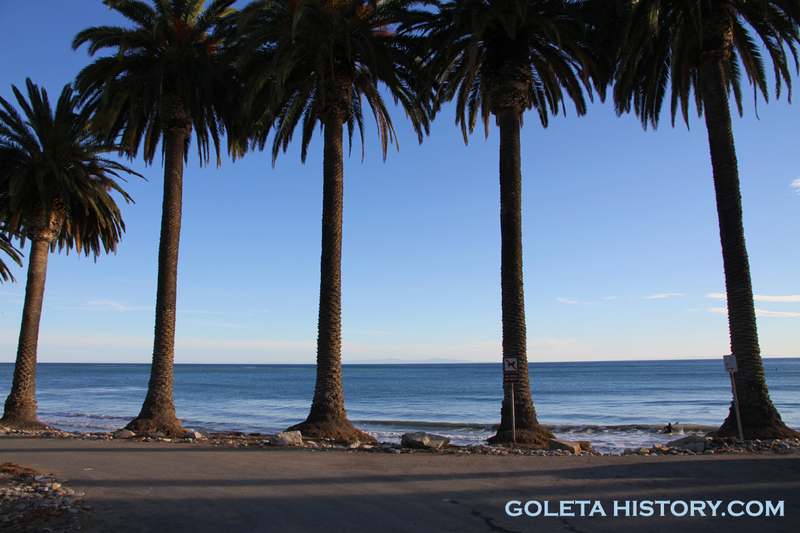 Tom, thanks for yet another great taste of Goleta history. 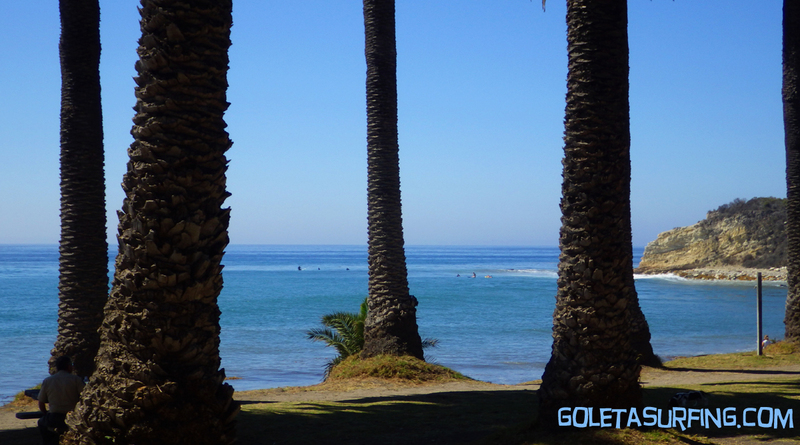 The silhouette of these palms with the Pacific in the background has been a favorite for decades. I hope the State gets their act together before they are lost forever. Thanks Tom! It seems there are a lot of sentimental ties to those palm trees. So now the questions arise “Should nature be allowed to take it’s course?” “Should we SAVE THE PALMS? And your point about this being a state park is well taken as it might make local action much more complicated. Plus, we’re dealing with the State…Not sure what can be done, if anything, sadly. 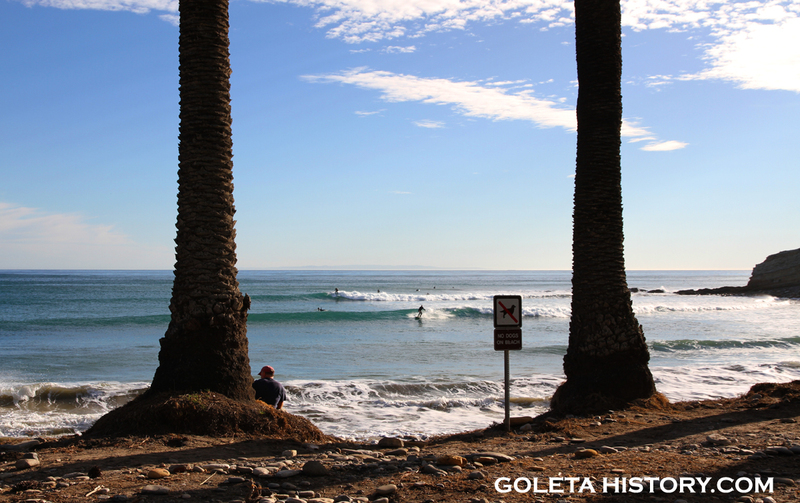 Tom, It is great to keep up with the Goleta Surfing website and history that you provide us with from afar. 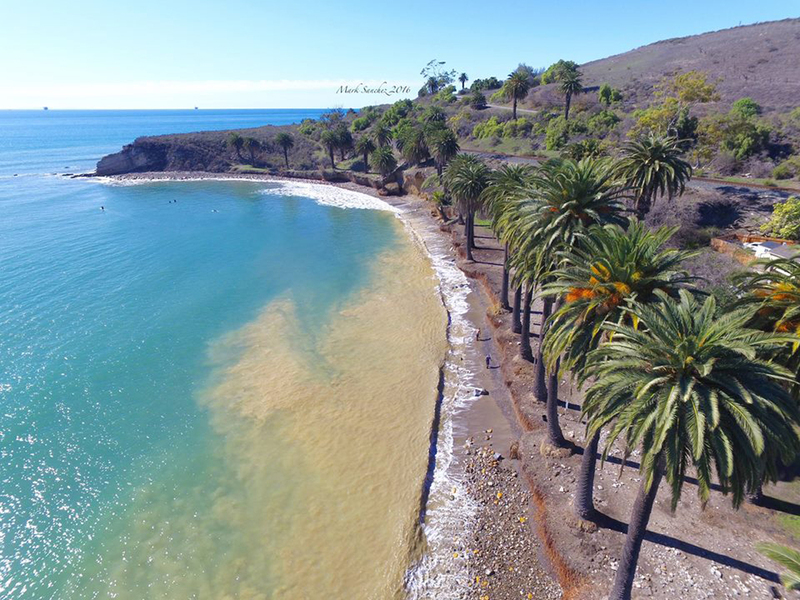 I visited the Santa Barbara Shores beach last year with my brother Mike and was astonished to see what has happened to a once great beach facility of my childhood days surfing and camping on the beach. Much has changed, keep up the great work you help bring back fond memories! 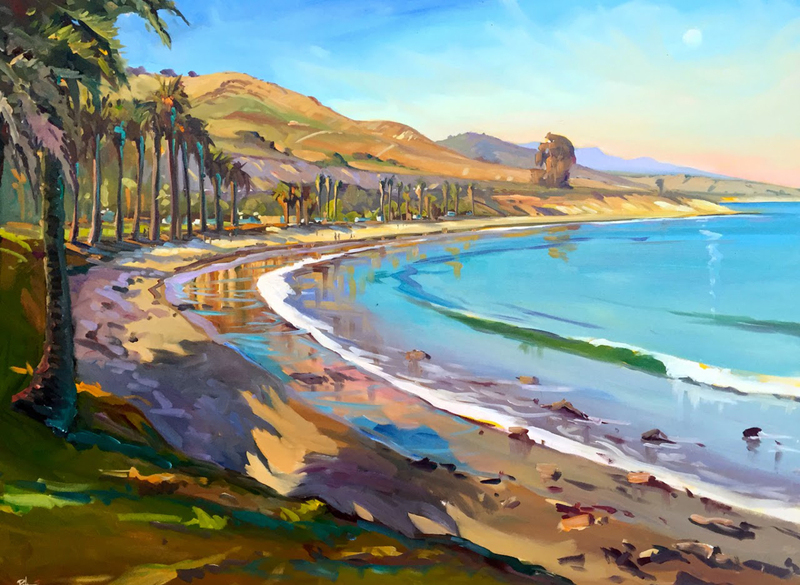 Thanks Tim, Goleta has certainly changed since we were neighbors on Santa Barbara Shores Drive, and so have we! But seriously, that’s the reason I felt the need to start the history page. 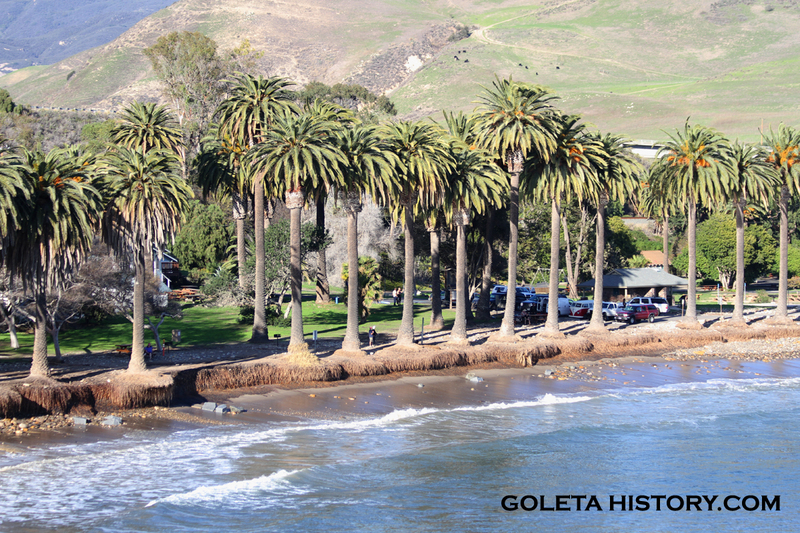 Our little town is in danger of losing it’s identity, and with all the newcomers, I think the rich history of Goleta needs to be remembered. Thanks for the note and glad you enjoy the sites. Those palm trees are a defining memory of my childhood. I’m sad to watch them fall into the sea, one by one – it would be great if State Parks would just plant a new row of them on the other side of the parking lot for future generations. Can’t believe how barren it was there pre-campground! I agree Will. They are a treasure, unfortunately the “Powers That Be” don’t see them that way. One ranger referred to them as rat’s nests. When they first began to drop, I offered several suggestions, but none were even considered. Lack of funding is the primary reason for everything they can’t do anymore.